One Republican senator has an unusual idea for ensuring that the effort to overhaul the tax code benefits among the poorest working Americans. Sen. Lindsey Graham plans to propose tying an increase in the federal minimum wage to the tax overhaul package. That’s what Graham, a South Carolina Republican, really wanted to talk about as he emerged from the Senate chamber following Thursday night’s rather tame vote-a-rama. “I just think it makes sense to me. You know, we’re going help businesses. I wouldn’t offer a minimum wage increase unless we cut taxes. We’re going to have a pass-through rate reduction, a corporate rate reduction. We’re going to simplify the tax code,” Graham said. The Trump administration has been pushing a Council of Economic Advisers report showing that the proposal to bring the corporate tax rate down to twenty percent could be a boon not only for U.S. businesses, but also for workers. But skeptics argue that the tax savings might be used for stock buybacks or dividends by publicly-traded companies. Graham’s proposal seems to be to force that savings get passed on to employees, at least at the lower end of the pay scale. Graham thinks his minimum wage proposal, which he suggested could phase the wage up to $10.10 an hour, could help woo Democrats to support the bill. 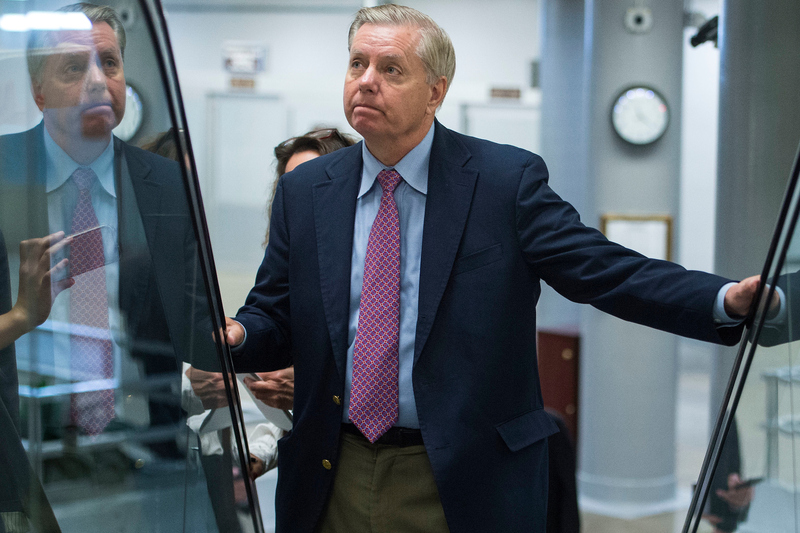 Graham’s effort would need to win over significant bipartisan support, since the Senate budget reconciliation rules could easily stop the the South Carolina senator in his tracks. The Health, Education, Labor and Pensions Committee will not be receiving reconciliation instructions as part of the budget resolution passed by the Senate Thursday night, so such a measure would likely be outside the scope of protections against filibusters. Despite some outreach by President Donald Trump and other Republicans to Democrats on the tax policy debate, the Graham minimum wage could be the first example of a concrete sweetener that a Republican is offering to the Democrats, no matter how far-fetched such an addition may be. “There are plenty of Democrats that would probably benefit from helping President Trump on tax cuts,” said Graham.